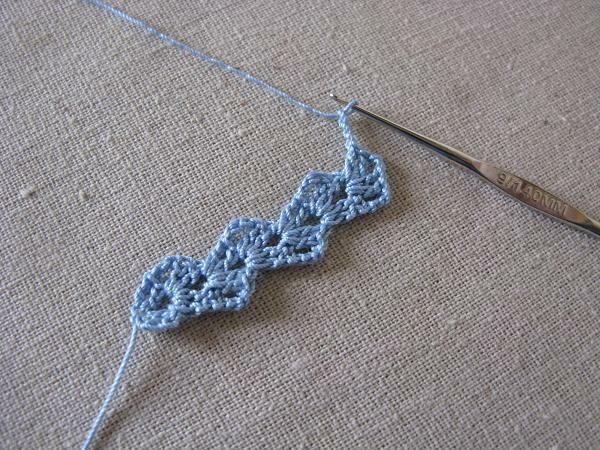 Here is the tutorial I promised, describing how to make the crocheted trim I posted about here. The tutorial is short because this trim is truly so easy. ;o) If you have any questions, and especially if anything seems unclear, please don't hestitate to ask. Using size 10 crochet thread and a size 9 steel hook, cast on and chain 4. In the 4th chain from the hook, make 1 dc. Chain 2. In the same space, make 2 more dc. Ch 3, then turn. Repeat the previous round (between the **) for desired length. Fasten off by clipping the thread and pulling the end through the loop. Weave the loose threads in to finish the ends. I use steam from the iron to block the trim. 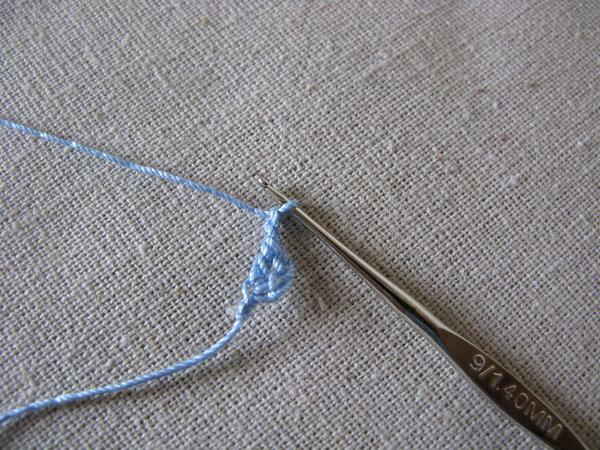 This removes the twist and sets the stitches. Then I wash and dry the trim, along with whatever fabric item I’m using. This allows the trim and the fabric to shrink, if either needs it. Then, I steam the trim again to make it flat and easy to sew. Sometimes it is difficult to anticipate the length of trim that I need. The longer the project, the more difficult it seems to be. 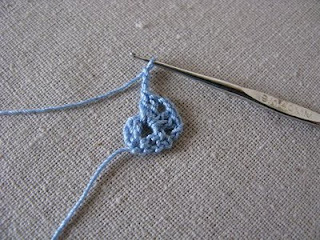 Because the brands of threads are different, I always crochet at least an inch or more beyond the length called for by measuring. Because of this, I don’t finish the top end until everything has been washed and preshrunk. I do fasten off by clipping the thread and pulling it through the stitches. This is so the length doesn’t unravel in the wash. But if I don’t weave the top thread end in yet, I can make a final fitting to the fabric. 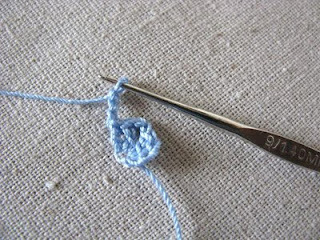 Then I can undo that last bit and pull out the stitches that I don’t need. I really don't have much trouble with the thread shrinking, but it never hurts to wash everything together. Here is a final, close-up picture of the stitches. You can clearly see the double crochet V-stitches in the shells and the turning chains on the outside of the trim. Shared on Raising Homemakers Wednesday Link-up. Shared on Women Living Well Wednesday Link-up. Shared on Prairie Flower Farm Building Our Homes Link-up. Hey, I love your trim! It's so pretty. I am stopping by from Prairie Flower Farm. it is always nice to make new friends. Hi Kathleen......thank you so for coming over. I love this. So sweet and dainty. Think it would be sweet on the end of a tea towel or end of pillow case. What else do you use your trims on? Only answer if you have time. I think this would be so pretty on a pillow case. 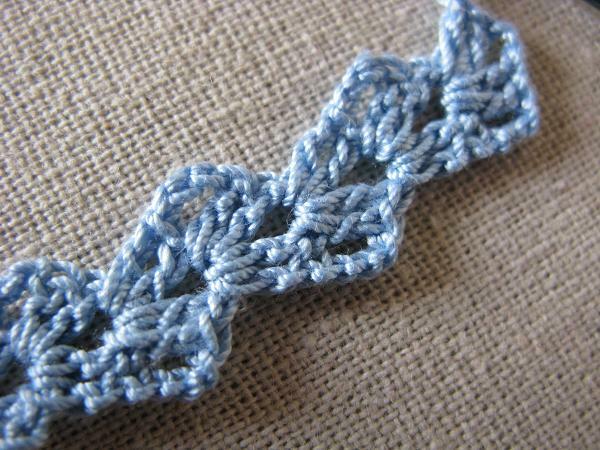 I've made crocheted trim years ago, but this is daintier and much prettier than what I made. I'm not as adept at crocheting with thread as I wish I was. I do better with yarn. Thanks for sharing! It's lovely! I thank all of you for your generous comments, and I'm happy to have you visit. This trim looks a lot like rick-rack, so I could add it to anything that rick-rack would go on. I think it looks good along the woven strip on bath towels and on kitchen towels. It is very sturdy and seems to take laundering well. I think its very lovely along the stitching of the hem on pillowcases and the top sheet as well. Really, it is so quick to make that it doesn't take too long to get enough for the sheet along with the pillowcases. 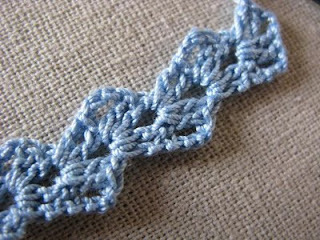 I've used it a number of times on clothing, it does look sweet around the neck edge or hem of a t-shirt or sweatshirt. It really dresses it up. Just remember that it doesn't stretch. I am so pleased to see this, now I know how my grandmother made the trim on the pillowcases she gave me! thank you for sharing this edging...it is just perfect to make trim with thrift store bought thread I discovered was a perfect match for a new blouse! 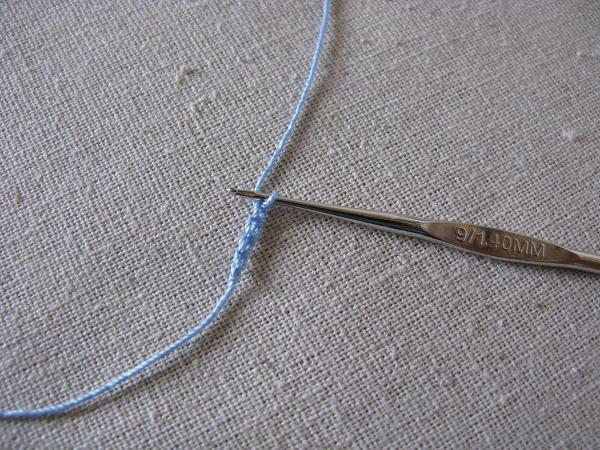 I think that you would be using a very small hook, I am using a size 9 with a sz10 thread.. soo. 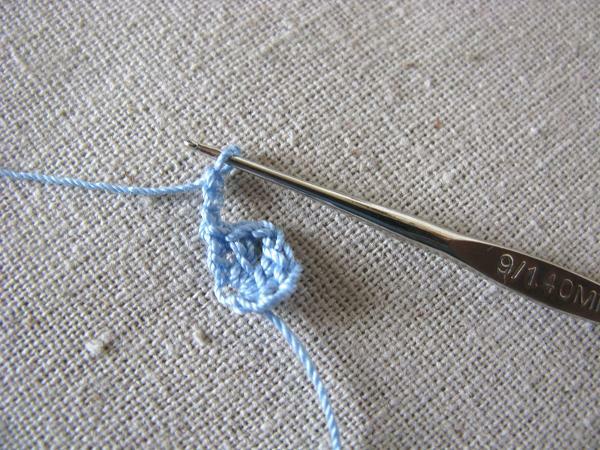 it seems to me that 10 or whatever size it takes to achieve an even number of stitches per inch or so... right?? ?